NBC is hosting a marathon of "The Office" tonight from 8-10 p.m. 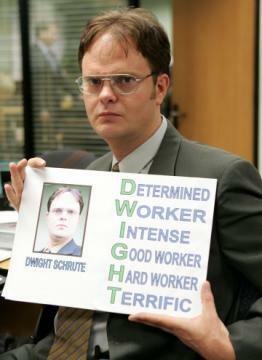 I read a few days ago in the Seattle Times that Rainn Wilson, who plays Dwight (pictured), is originally from Shorecrest and attended the UW, where he graduated with a degree in drama in 1986. "The Office" is absolutely the funniest show on television and you owe it to yourself to sit down and watch it. For every show you don't watch, I will kill you. There will be a quiz tomorrow. Be prepared.